Say a student uses an introductory psychology e-textbook. The book will be integrated into the college’s course-management system. It will track students' behavior: how much time they spend reading, how many pages they view, and how many notes and highlights they make. That data will get crunched into an engagement score for each student. The idea is that faculty members can reach out to students showing low engagement, says Sean Devine, chief executive of CourseSmart. And colleges can evaluate the return they are getting on investments in digital materials. Well, the idea might be that it will help students will low engagement, but you can bet that it won't stop there. It will also be used to spy on whether students are cheating, as indicated by an implausibly small number of hours spent reading texts; or it might be used to check on whether books are being lent out to friends who aren't "authorized" to read that copy, as evidenced by unusual reading patterns. Similarly, it's easy to imagine colleges starting to put pressure on students to read in certain rigidly-defined ways in order to "maximize" the return on that investment in digital materials -- hardly what education and learning to think for yourself are all about. Maximizing return will doubtless also lead to this reporting feature becoming mandatory -- at the moment students can opt out if they wish -- purely in the name of efficiency, you understand. What's really tragic is that digital textbooks have the potential to be used in all kinds of truly innovative ways -- for example, allowing a class to share annotations in real time, making the whole reading experience more social; or perhaps editing and combining texts to produce exciting re-workings and re-imaginings. Instead, publishers are obsessed with tracking users and controlling how they use ebooks, largely out of an absurd, underlying fear that somewhere along the line somebody might be doing something without paying for it. That our model is sustainable and that students and professors like our product is best illustrated by the fact that our traffic has grown on average 100% per year since 2009. This year 40,000,000 ebooks will be downloaded from bookboon.com. This growth we have financed by retained earnings only. We have not taken in outside investments, which otherwise has been the standard when someone wants to offer free education material, and still most of these have had to give up on their original vision to survive. Because we are profitable and independent, we will be able to continue to grow our business in the coming years and provide free textbooks, to the benefit of all students. Some tried to take the story about Flat World Knowledge and argue that it proved that "free" didn't work. But, as we noted, all it proved was that how Flat World Knowledge implemented it as a part of a business model did not work for them. Others, using "free" in other ways as part of a complete business model, are figuring out how to make it work, and Bookboon appears to be a good example of that in action. 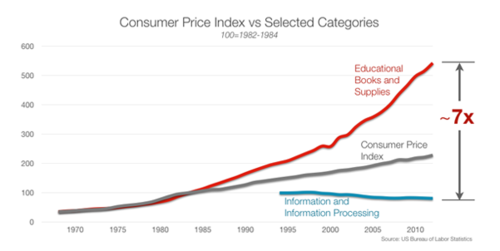 The fact that textbooks are too expensive is something that has been documented pretty well here. For example we have the stories of students paying over $180 for an art history book that contains no images, and a student being sued for copyright infringement for selling legally purchased imported textbooks for cheaper than the publishers want. The high cost of textbooks is such a problem that even some governments are taking steps to mitigate that cost. vmanda sends news that the government of Guyana has begun buying pirated copies of textbooks for its public schools because the publishers charge way too much. The government of Guyana is making no apologies about the fact that it is buying pirated textbooks for public schools as a cost-saving measure. Cabinet Secretary Roger Luncheon says officials are buying pirated books from printing firms and companies that photocopy books because of their high quality and lower prices. Luncheon said the government's move is justified. Of course the publishers of those books are not too happy. In a statement from Emma House of the Publishers Association, she states that the government is breaking many laws. The Cabinet’s decision in Guyana to procure pirated textbooks for public schools is an indisputably illegal act. This decision is in contravention of Guyanese law, Caribbean law (CARICOM’s revised Treaty of Chaguaramas) and the international Berne Convention. Of course, what the PA seems to be overlooking is just why Guyana has chosen to ignore international copyright. It feels that the books are just way too expensive. By insisting on high prices, the publishers who make up that organization have put themselves out of reach of this country. Further, the fact that the government is willing to pay for books from pirate book printers is proof that the publishers could do much more to get Guyana to buy legally. Instead, the publishers have chosen to bully the country into paying out more for books than it can. This is once again the result of copyright holders refusing to adapt to the marketplace, even a marketplace they have built their business around. These publishers have gotten so used to price gouging their customers that they do not know how to properly respond to someone choosing a cheaper alternative. Because the publishers have blinded themselves from reality, they are failing here. If they were actually willing to learn, they would take a step back and work with the government of Guyana to come up with a pricing plan that would actually work. Of course, that might be too much to ask from some companies. Update: vmanda has provided an update stating that, at the behest of the Publishers Association, a Guyanese court has granted an injunction against local companies that illegally copy textbooks. This means the the government will no longer be able to buy pirated textbooks for the time being. There is no word yet on the government's response to the injunction. Students in the class have put up a petition to protest what they quite correctly call a "sham." It's even more bizarre given that recent court rulings in Canada would suggest that the images in question would be given pretty broad "fair dealing" protections for the purpose of education. But, just the threat of copyright claims, apparently, are creating an absolutely ridiculous situation. Endlessly mounting tuition isn't the only factor turning a college degree into a lifetime of student loan payments. Textbook prices are keeping pace with tuition, both of which are charging far ahead of inflation and wages. There's no monopoly on the textbook market, but over 80% of it is controlled by the top four publishers (Pearson, Cengage, Wiley and McGraw-Hill). This control gives them enough leverage to maintain a 65% gross margin on their offerings. The newest faces in the textbook world aren't making anything better. EDMC (Education Management Corporation), which operates several for-profit post-secondary schools (Argosy, The Art Institutes, Brown Mackie College) has its own e-textbook publishing arm, Digital Bookshelf, which handles all of its e-book offerings. As recently as last year, some were hoping the move to digital books would bring these prices down. Instead, digital offerings are arriving locked down, requiring students to purchase access codes which prevent the sharing of books and eliminates the resale market. It's a common scenario and most college students appreciate a teacher who's looking for ways to deliver a quality education without requiring them to make unnecessary book purchases. Unfortunately, in the case of Mike Tracy, a highly-regarded animator who'd been teaching at the Art Institute of California-Orange County for the past 11 years, refusing to make students buy an e-book they don't need may have cost him his job. Tracy posted on his Facebook page that he's "been in a dispute" with the school for several months "over their policy of mandatory e-textbooks in classes where their inclusion seems arbitrary, inappropriate and completely motivated by profit. EDMC continues to insist on e-books only and wants sole discretion over what e-books are used, compromising faculty independence and expertise in choosing best resources for class. Not only are instructors not allowed to opt-out of this "service," students are forced to pay extra for versions they may not even need. Art Institute requires students to pay a $50-$75 fee to download a temporary copy of the e-textbook from the Digital Bookshelf. Even if they want to buy a hard copy of the text, they still have to fork over the money for a digital version. Note that this is a temporary copy, so there's no passing it on to another classmate who might be taking the course in the next semester. This also prevents any sort of resale/trading taking from taking place. One of the slim advantages of purchasing physical copies was the ability to resell the books to help offset the costs of the next set of curriculum. The textbook publishers have turned that into a complete farce by adding minor revisions to their line of books as often as possible, changing a few homework problems or pushing text back and forth to force re-pagination. Many books are outdated before the next year of schooling even starts, turning a $150 investment into a doorstop. Going electronic-only, tied to pass codes and non-refundable fees eliminates any further recoupment for the students. Beyond the ugliness of these mercenary tactics is the fact that what EDMC is doing is, if not actually illegal, certainly operating in a very gray area. The Higher Education Opportunity Act (passed in 2008) states that textbook publishers must "unbundle" their core educational content from optional add-ons like study guides or homework systems. It could be argued that an electronic version of the same textbook is not an "optional add-on," but one could also certainly argue that the option to buy either/or when it comes to digital and physical books should still be left to the students' or instructors' preference, rather than subjecting students to mandatory, non-refundable fees. The government's complaint says the company, which offers classes online and at 105 locations in 32 states and Canada, repeatedly made false statements to conceal its practices and receive $11 billion in federal and state financial aid – nearly all of the company's revenue. The complaint alleges that student enrollment was the sole focus of its compensation system, and the company instructed recruiters to use high-pressure sales techniques like playing on an applicant's psychological vulnerabilities and inflating claims of career placement opportunities to enroll students regardless of their qualifications. Beyond the resale blockage and rent-seeking is the outrageous idea that somehow courses should have mandatory textbooks, thus forcing instructors to teach their classes in whatever direction the curriculum provider steers them, rather than being able to impart knowledge in a way that caters to the instructor and the students. There's no way that locking your faculty and students into purchasing and utilizing textbooks from a single provider is ever going to work for the benefit of anyone but the company being favored and the administration members who made this exclusive contract a reality. EDMC can have it both ways for the moment, operating both a set of schools and providing its own exclusive conduit for instructional material. As for Mike Tracy, his students have banded together to get him reinstated. They've also started a petition over at change.org, asking for the Art Institute to amend its textbook policy to put curriculum selection back in the hands of the instructors. It currently has over 3,500 signatures. While some schools and teachers are looking for ways to make education, and especially textbooks, cheaper for students, others seem bent on doing everything possible to keep prices artificially high. Because colleges essentially have the textbook market cornered, they can require students to purchase just about anything in order to bring in more revenue. Unfortunately for the students, this can mean increased costs and and annoyance with the process itself. Enter Luke Thomas, who had a very annoying textbook situation in an English class. All Luke and his wife wanted to do was take an English class together. They figured that they could get by with a single textbook between the two of them, but things in college are never that easy. You see, the professor for their class required a specific book, which he had authored, as well as an one time use access code to an online discussion board. However, the only way to get that code was to buy a brand new textbook. My wife and I were taking that same class, and we were unable to purchase an access code without purchasing two copies of the book, which was very upsetting. I asked the individuals working at the bookstore if they sold unbundled copies of the access code, and to my dismay, they did not. Because buying two books for two people who lived together and took the class together was a pointless endeavor, Luke decided to take matters into his own hands. He contacted the service provider of the discussion board and was able to buy the code directly through them for $20 plus shipping. Yes, the code had to be physically shipped to him. Of course, this was an option that neither the professor nor the book store offered him to begin with. As a former college student in this internet connected world, I am also aware of such shady textbook deals. One Trigonometry class I took required the purchase of a $75 access code to the online textbook and quizzes. While my course wasn't tied to a physical book, it did limit the end of semester cash that most students are used to getting as they sell off their books -- something that schemes like this do not allow. UNBUNDLING OF COLLEGE TEXTBOOKS FROM SUPPLEMENTAL MATERIALS.—A publisher that sells a college textbook and any supplemental material accompanying such college textbook as a single bundle shall also make available the college textbook and each supplemental material as separate and unbundled items, each separately priced. Wow! Wouldn't that be something to bring up to that professor and his supervisors? That is, if they will actually listen. However, there is also another path that might serve a student in getting a quick resolution to the matter of being forced to buy a new book to get such online materials: patent law. Perhaps this professor is unaware that his method of forcing students to buy a new book and prevent sharing has been patented. Wouldn't that patent showdown be a joy to watch unfold? Lucky for us, there are plenty of people out there looking after the plight of the poor college student. Luke takes the time to highlight a few notables out there. It looks like there’s light at the end of the tunnel, companies like Boundless Learning, Lore, and the plethora of ed-tech startups are seeking to disrupt these greedy giants. Go get em guys! With all the attention that high college tuition prices get in the media, one would think that the textbook industry would be a prime target for an area to reduce the cost of an education for students. Sadly, the textbook industry gets a pass by most budget hawks as they tend to focus the majority of their attention on the sticker price of college. If they would expand their focus they could probably see a lot of room for improvement in additional costs outside tuition. Until then, good luck paying for all those books you may or may not need. What Kind Of Professor Patents A Way To Make It More Expensive & More Difficult For Students To Learn? Torrentfreak has the story of an economics professor (of all things) who has apparently received a patent on a way to try to force students to buy expensive textbooks. The professor, Joseph Henry Vogel, is positioning this patent (8,195,571) as an "anti-piracy" technique, though it appears that it works equally well in preventing students from sharing a single textbook or merely checking the textbook out of the library. The details of the patent are hardly new or innovative either. The basics are that the class has both a textbook and an online discussion board -- and buying the textbook provides you a code that allows you to enter the discussion board. In theory, you could also just buy the code. How the hell does something like this get patented in the first place? There is a tremendous amount of prior art in the form of things like "one-time" use codes for video games and other digital offerings to limit the used sales market. And yet this still gets approved? USPTO examiner James D. Nigh should be ashamed for letting this piece of garbage get approved. The claims here (the patent only has four) are so broad and so general, I don't see how it passes the non-obvious test, nor how it is anything more than mashing together a few different things that are widely available already and have been for years. After the KSR ruling the USPTO was supposed to reject broad patents that just combined basic concepts already found in the market. How could a professor of economics actually think that locking up access to information is a good idea? That alone would make me avoid any class that he taught, as his understanding of information economics is way, way off. It's sad that anyone in academia would think that this is a good idea. In an age where Harvard and MIT are investing a ton into opening up access, this guy is focused on locking it down. The whole thing is extraordinary for how bad of an idea it is -- and the fact that a patent was actually issued on this only compounds the ridiculousness. According to The College Board, the average college student spends over $1,000 per year on textbooks. At community colleges, the cost of textbooks alone can often exceed 50% of a student’s overall educational expenses. Is it any wonder that 7 in 10 college students have skipped buying a required text due to price concerns? The textbook publishing market is an oligopoly, with over 80% of the textbook market controlled by the top 4 publishers: Pearson, Cengage, Wiley and McGraw-Hill. These publishers have been able to maintain nearly 65% gross margins on what is essentially a commodity product. They have continued to raise prices for this stagnant product in the face of innovation in every other information related industry, growing at a rate of 3 times inflation. Defendant is in the business of distributing online textbooks that it claims serve as "substitutes" for Plaintiffs' textbooks. Rather than produce its own textbooks, however, Defendant steals the creative expression of others, willfully and blatantly violating Plaintiffs' intellectual property rights in several of their highest profile, signature textbooks. Defendant exploits and profits from Plaintiffs’ successful textbooks by making and distributing the free "Boundless Version" of those books, in the hope that it can later monetize the user base that it draws to its Boundless Web Site. Notwithstanding whatever use it claims to make of "open source educational content," Defendant distributes "replacement textbooks" that are created from, based upon, and overwhelmingly similar to Plaintiffs’ textbooks. Defendant generates these "replacement textbooks" by hiring individuals to copy and paraphrase from Plaintiffs’ textbooks. Defendant boasts that they copy the precise selection, structure, organization and depth of coverage of Plaintiffs' textbooks and then map-in substitute text, right down to duplicating Plaintiffs’ pagination. Defendant has taken hundreds of topics, sub-topics, and sub-sub-topics that comprise Plaintiffs' textbooks and copied them into the Boundless texts, even presenting them in the same order, and keying their placement to Plaintiffs’ actual pagination. Defendant has engaged in similar copying or paraphrasing with respect to the substance of hundreds of photographs, illustration, captions, and other original aspects of Plaintiffs’ textbooks. So the accusation seems to be that Boundless books are functional "clones" of existing textbooks, with the same overall organization and pagination, but with different words filling out the topics, sub-topics and sub-sub-topics. The question then becomes whether there is copyright in that arrangement. An example of the obvious nature of Defendant’s photographic paraphrasing can be found in Chapter 8 of the authentic version of Campbell’s Biology where Plaintiff Pearson and its authors describe the First and Second Laws of Thermodynamics. To exemplify those laws, Plaintiff Pearson and its authors included two photographs, one of a bear catching and eating a fish, and another of a bear running. Plaintiff Pearson and its authors could have used any one of a universe of possible photographic subjects to demonstrate the laws of thermodynamics, but, based on the manner in which they wished to express their aesthetic and scholarly judgments, they opted for the bear engaged in these activities. In Chapter 8 of the Boundless Version of Cambell’s Biology, Defendant also discusses the first and second laws of thermodynamics. Defendant also includes two photographs to exemplify these laws, but instead of basing its selection and ordering on their own aesthetic and scholarly judgments, the two photographs Defendant includes are also of a bear eating a fish and a bear running, reflecting only the previously made creative, scholarly and aesthetic judgments of the authors and editors of Campbell’s Biology. Is the use of a bear eating a fish a creative choice? Or is the creativity only in how the bear and the fish are depicted? In many ways, this is the same question put to a UK judge recently concerning a photo with a red double-decker bus crossing a bridge in London. In that case, rather surprisingly, the judge found that you could copyright the basic idea of a photograph. We’re currently preparing our full response, and we believe that the allegations in this lawsuit are without merit and we will defend our company and mission vigorously. So it sounds as if we may get a chance to see where a US judge stands on that key issue of the idea/expression dichotomy in the case of academic textbooks and pictures of bears. This could be interesting. Polish Prime Minister Office yesterday accepted "Digital School program" with "Digital Textbooks" component included. With 45 million PLN (approx. 15 million USD) funding it has been the biggest governmental Open Educational Resources initiative in Poland so far. The government has decided to fund creating full set of educational materials for grades 4-6 (9-11 year olds). All those resources will be available under CC BY license, which is fully free license according to the Definition of Free Cultural Works. This draft [of the Digital School program] was accepted by Ministry of Education, but at a later stage of preparations the free licensing requirement was left out. Both Open Education Coalition and Modern Poland Foundation took part in the public consultation process; their comments in support of free licensing were taken on board in the very last minute. Without that free license, this would have been just another scheme to produce government-funded educational materials. But with the license, those resources can take on a life of their own through re-use, improvement and wide-ranging adaptations. And once teachers, parents and students begin to see what can be done with freely-licensed educational materials that is hard or impossible to match with traditional licensing, the demand for them is likely to grow. This makes the last-minute acceptance by the Polish government that the materials would be released under the cc-by license, after some apparent reluctance, doubly welcome, since it may well help to trigger the production of further open educational resources both within and beyond Poland.